Steven Rostedt, Debugging the kernel using Ftrace - part 1, https://lwn.net/Articles/365835/, 2009. Steven Rsotedt, Secrets of the Ftrace function tracer, https://lwn.net/Articles/370423/, 2010. Andrej Yemelianov, Kernel Tracing with Ftrace, https://blog.selectel.com/kernel-tracing-ftrace/, 2017. .ident  "GCC: (Ubuntu 7.2.0-8ubuntu3) 7.2.0"
Steven Rostedt, Ftrace Kernel Hooks: More than just tracing, https://www.linuxplumbersconf.org/2014/ocw/system/presentations/1773/original/ftrace-kernel-hooks-2014.pdf, 2014. Steven Rostedt, Using the TRACE_EVENT() macro (Part 1), https://lwn.net/Articles/379903/, 2010. Steven Rostedt, Using the TRACE_EVENT() macro (Part 2), https://lwn.net/Articles/381064/, 2010. Steven Rostedt, Using the TRACE_EVENT() macro (Part 3), https://lwn.net/Articles/383362/, 2010. Sudhanshu Goswami, An introduction to KProbes, https://lwn.net/Articles/132196/, 2005. 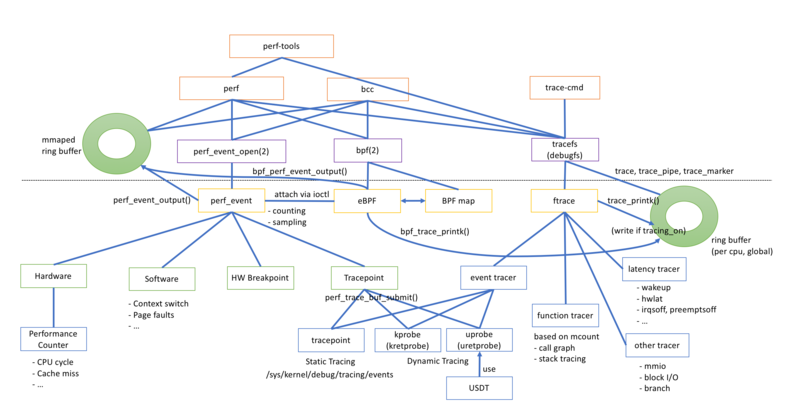 Steven Rostedt, Ftrace Profiling, https://events.static.linuxfound.org/sites/events/files/slides/collab-2015-ftrace-profiling.pdf, 2015. 2   allow only user-space measurements (default since Linux 4.6). 1   allow both kernel and user measurements (default before Linux 4.6).